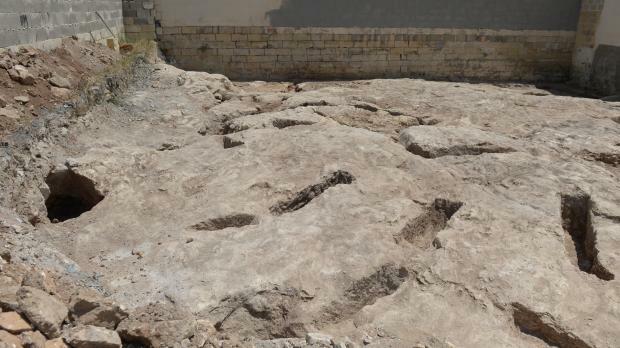 Archaeological remains have been discovered on a building site in Tarxien, and authorities are carrying out an investigation to discover the extent and significance of the remains. The plot, located in Ġorġ Caruana Street, approximately 200 metres away from the Tarxien Temples, is currently covered by a development application for the construction of a block of apartments, including two underground garages. The remains currently visible, approximately two metres below street level, consist of a series of stone-cut agricultural trenches, which were used to irrigate fields from antiquity up until the 19th century. Deputy superintendent for cultural heritage Nathaniel Cutajar said an archaeological investigation on the site was still ongoing and it was unclear if the plot housed any significant remains. The trenches would likely not be reason in and of themselves to halt development on the site. “The results of this investigation would inform all parties on how to proceed with the application. Should important archaeological remains be discovered they would have to be preserved in line with existing legislation on the matter,” he said. Tarxien resident Joe Cassar, a former magistrate and amateur historian, said the surrounding area was rich in archaeological remains, many of which had not been extensively documented or preserved. “Sir Temi Zammit [who excavated the Neolithic temples] thought he had uncovered everything in the area, but all he found was a small part,” Dr Cassar said. He pointed to a large exposed stone in St Francis Street that he said had the same origin as the temples, and added that in one instance a hunter’s hide (dura) had been found to have been constructed from the same material, while another discarded plot held the remains of a Neolithic apse.